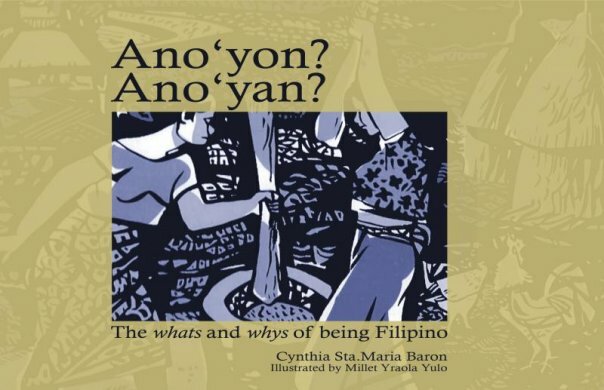 by Christine Balmes Among the malongs and beaded jewelry in the balikbayan box my mother brought from the Philippines recently, I found this book called "Ano 'Yon? Ano 'Yan? : The Whats and Whys of Being Filipino." Aba! [ah bah´] An expression of surprise or indignation. It is usually uttered by an older, wiser person to someone younger, less experienced. First of many words your grandmother could say when you, at 35, tell her you are old enough to live on your own. Considering that I, at the ripe old age of 25, was thinking of moving out for the first time, but worrying about how to explain it to my larger Filipino family, I found this entry really telling. It's like catching sight of a funny face across the room and suddenly realizing it's my reflection. I realized what a big role my Filipino upbringing played in my personal decisions. I was laughing at myself. But I was also laughing at our culture. The rest of the book is a dictionary list of Filipino vernacular, slang, idioms, and phrases that you’d rarely find in Filipino-English dictionaries or learn from your language instructor. The definitions are often funny and clever, sometimes ironic and self-deprecating, but always revealing. Kanto. [kan´toh] This means corner. If one is called a kanto boy, it means he loiters at street corners doing heaven knows what. Hulugan. [hoo loo gan´] Many Pinoys just don’t have any disposable income. To buy on installment is the only way to go when acquiring pricier items. This practice cuts across socio-economic lines. The rich use their VISA cards, the poor borrow from shrewd merchants charging exorbitant interest rates. Lakwatsa. [lak wat´sa] From the Spanish lacuacha meaning to loiter, to go around aimlessly with truancy in mind. Lakwatsera/o is the person. Common among college kids who spend all their parents’ hard earned money, but don’t attend classes. So kids, have a heart. Flip burgers or run a corner store if it’s not your thing to study. But wait, it gets better. It turns out the book is actually just the hardcopy part of a larger, more interactive, online Filipino dictionary, where people anywhere in the world who have access to the internet (that means YOU and the person beside you) can submit other Filipino words and expressions and their definitions, or comment on existing words. Think of it like urban dictionary.com but in the Filipino language. So if your lolo has a favourite expression whose meaning always baffled you, or if you heard a Filipino word recently, search for it here. Alternatively, if there’s an expression you and your friends want everyone to start using, post it here too. Hope to see your entries there soon!